Bracelets made of caoutchouc are becoming more and more popular in the watch industry as a whole, and particularly in the "Haute Gamme" segment. No wonder: this incredibly versatile material is valued for its perfect flexibility as well as its extreme resistance capacity and its waterproof qualities. As leading manufacturer of bracelets for watches, Hirsch offers the best raw-material for functional bracelets and highly valuable product advantages with its latest innovation - Hirsch Premium Caoutchouc - a specially developed recipe on the basis of natural caoutchouc. Hirsch Premium Caoutchouc bracelets have special technical properties which guarantee a considerably higher life-time, a perceptibly higher wearing-comfort as well as a higher resistancy against external influences, in comparison to conventional synthetic bracelets. Did you know that the term caoutchouc is derived from the Indian terms cao = tree and ochu = tear and was used by the ancient cultures of Central and South America as long ago as the second millenium BC? Its water-repellent property was also known and appreciated: the Mayas are said to have covered cloths and their feet with a coating of natural caoutchouc as a protection against water. Stability in form, tear-resistancy and considerable resistancy against external influences such as UV-light and chemicals. Extended lifetime (3 - 5 years, even when heavily used), compare: metal. 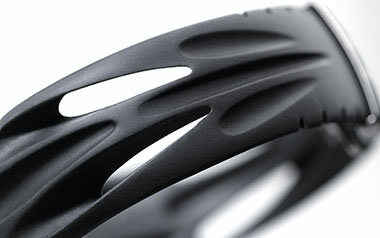 Natural surface feel, highest wearing-comfort (comfortable feel) - compare: metal (see above). Easy cleaning and care - warm water and soap will do!